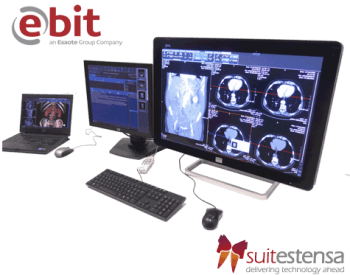 SUITESTENSA is the RIS PACS imaging & information management software platform developed by EBIT AET, THE Esaote’s Business Unit dedicated to healthcare IT diagnostic processes. SUITESTENSA bridges RIS PACS and applications in an innovative way. Based on web-enabled technology, SUITESTENSA exploits DICOM 3.0, HL7 and FDA-XML standard communication protocols, supporting systems’ interoperability and avoiding data duplication. SUITESTENSA RIS PACS implements the newest Structured Report, 3D & 4D for CT/MR/PET and mobile PACS technologies. SUITESTENSA RIS PACS is dedicated to Radiology, Nuclear Medicine, Radiotherapy, Breast Medicine, Interventional Radio, Orthopedics, Operating Room, with administrative, reporting and post-processing tools specifically dedicated to their needs. The graphical user interfaces are available in various languages. Contact us to know the availability of your language. The currently supported RIS PACS languages are: English, Italian, Spanish, Portuguese (Brazilian), German, Russian. Esaote S.p.A. Company EBIT provides direct technical assistance to customers, through pre-sales courses and seminars, and dedicated post-sale courses to all Personnel involved, and offers up to a 24h on-site maintenance service, depending on sales agreements. SUITESTENSA RIS CVIS PACS, manufactured by Esaote, complies with the Medical Device Directive (MDD) 93\42\EEC as amended by the 2007/47/EC. In accordance with this directive, SUITESTENSA RIS CVIS PACS is classified as Class IIa devices.